Some types of situations may concern you, but may not have you convinced your dog needs immediate care. In these cases, it is still best to err on the side of caution. Please call or just come into the emergency veterinary hospital. If you decide to call, our staff will do our best to help you decide the best course. Unfortunately, dogs will quite often mask symptoms and it may be difficult to determine the seriousness of the illness. We are here for you and will take care of your dog in the best way possible. 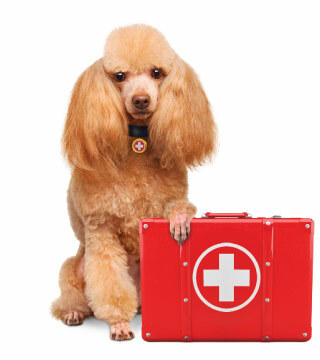 Proudly serving the Tomball metropolitan area for over 2013 years, Creekside Animal Hospital is open for any dog emergency that occurs. Simply call our hospital at (281) 720-7478, and our veterinary technician will put you in contact with our doctor on call. Or if you don't have the seconds to spare, please bring your beloved canine companion directly to us anytime day or night, weekends and holidays included. If you can, please call ahead so we can prepare for your arrival. During an emergency every precious second counts, the most important thing is to just get him or her to us as soon as possible, and we'll handle the rest.